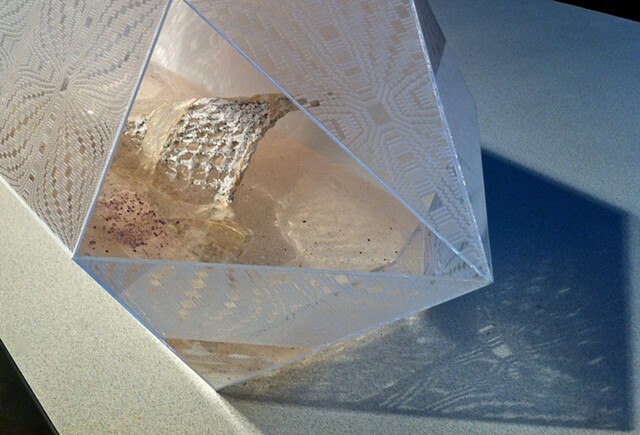 Laser-etched weaving draft (Blooming Leaf) pattern on Plexiglas, constructed into double-pointed quartz 'reliquary' with the assistance of Alexandra Lemus Rodriguez and Antoliano Nieto, mock ossified form (Mock Ossification IV) in gel wax secured inside. QR code laser etched to the back side of the object, leading to The Ossificatorium interactive website featuring constructed bio-based narrative (fictitious osteobiography). This object has not yet been abandoned, pending completion of 2nd GPS tracking unit.